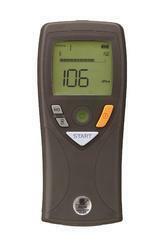 The Rion VT-06 Viscotester allows for easy measurement of Fluid Viscosity. The Rion VT-06 Viscotester is a successor to the popular VT-03/VT-04 Viscotesters that preceded it. The Rion VT-06 Viscotester features a Uni-Cylinder design for better measurements. It is designed for quality control applications in the manufacturing process of industrial products such as petrochemicals, paint and adhesives as well as foodstuffs. Viscosity measurements covering a wide range are possible such as gear oil used in construction machinery. Measurement is performed by simply submerging a rotor in the fluid. The resistance to rotor movement caused by the viscosity (torque) is measures to obtain readings.